Welcome to another edition of Penguin of The Week! This week we are awarding the user Adaleia. Adaleia is an active member both in game and on discord. She makes beautiful pieces of art for the community and never passes up the chance to make friends. She is very generous and helpful to everyone around her and never fails to make people laugh! If you see her around the island, don't pass up the chance to say hello! This post will contain all the important information you need to know about the upcoming Winterball that'll be taking place on Club Penguin Online this weekend. (2). Awards will be done on the server Sleet. There will be different rooms for different award categories. Again, we will tell which rooms to go on in our official Discord server. (3). We will be awarding users for Best Dressed, Singles, Best Quotes, Best LGBT Couple, and Winterball King and Queen. If you have any suggestions for a possible award then DM a moderator on our Discord server. (4). The game will update on Friday night to include all the Winterball rooms. (5). We will be hosting the awards on Saturday and Sunday. To make it more fair for everyone with different time zones, we'll be having 4 awards - 2 each day. On Saturday, the first awards (The 'European' Awards) will be at 1pm EST (6pm GMT). The second awards (The 'American/Main' Awards) will be then hosted at 7pm EST (12am GMT). On Sunday, the first awards (The 'European' Awards) will be at 1pm EST (6pm EST). The second awards (The 'American/Main' Awards) will be then hosted at 7pm EST (12am GMT). (6). The Spanish moderators might host their own Winterballa awards on the Spanish servers, however we will confirm this with Icedanx and the other moderators. For more information, please join our Discord server to get in contact with the moderators and administrators. Welcome to another edition of Penguin of The Week! This week we'll be rewarding two users to make up for missing last week. We'll be rewarding the users Fen12345 and Xnxzxw. Xnxzxw (or better known as Siri) is a very active and known member in our community. She is often helping members with getting stamps, pin locations, or any problem they might face. She also always helps the moderators by reporting misbehaving users. 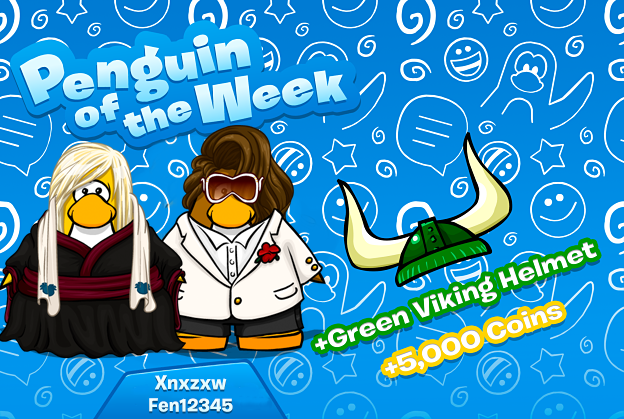 Fen12345 is one of the most active members in the Club Penguin Online community. He can always be found chatting in our Discord server and helping other players when they have questions or problems. He also helps the staff team by reporting rule breaking and contributes to the Wiki. Recently, we decided to give out Treasure Book Codes but we wanted to do it in a fair way for everyone to enter in. Therefore we made a raffle system! Any penguin that is activated and not banned permanently can be entered in the raffle. We will choose 2 winners every night around 10PM PST and they will receive their code via Discord(preferably) or Email. If you would like the code sent via Discord DMs, please set your nickname on Discord as "DISCORDNAME[CPO NAME]#0000", where "DISCORDNAME" is your actual Discord username and "CPO NAME" is your actual penguin username on Club Penguin Online. If we can not find you on Discord, we will email you the code. Winners will also be announced on Discord and on this post, as it will be edited. 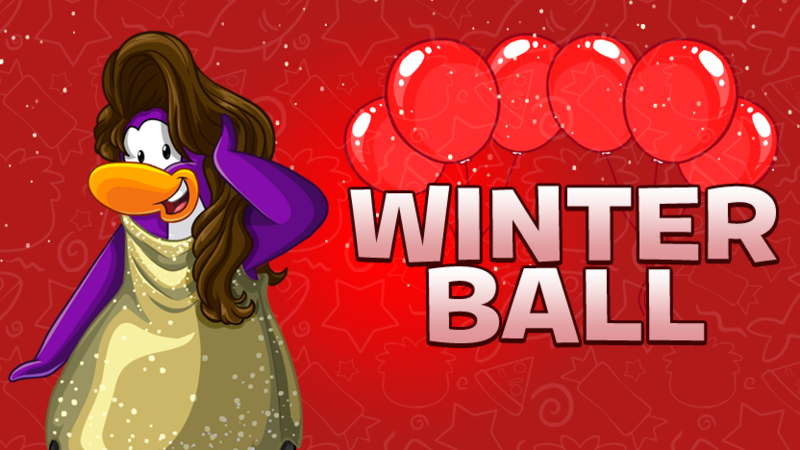 Club Penguin Online will be hosting The Winterball next weekend! If you've been apart of our community since the summer, you would be familiar with our Prom event that we hosted back in July. The Winterball will be similar to the Prom event we had, but better! We'll be adding new categories, new rooms, new codes, and winners will receive a lot of coins and a custom background! The Winterball will officially begin on December 14th, 2018. It will take place throughout the weekend and end on Sunday night. We will be hosting awards on both Saturday and Sunday. We will release a seperate post on Friday explaining how everything will work. If you're not on our Discord, then I suggest you join as we'll be announcing the Prom Kings & Queens on the official Club Penguin Online Discord. We all hope you have fun with this new update and of course, at the Club Penguin Online Winterball! We have now entered December, a month where you will be seeing a lot of updates pushed onto Club Penguin. We will be adding the new catalogs this weekend, a long with another update that will happen either tonight or Saturday night in preparation for a custom event that's happening next weekend. Tomorrow we'll be hosting another #ModMeetup. We will be giving out small hints on what to expect to see on Club Penguin Online as we prepare to enter 2019 and finish this year on a good note. Welcome to another edition of Penguin of The Week! 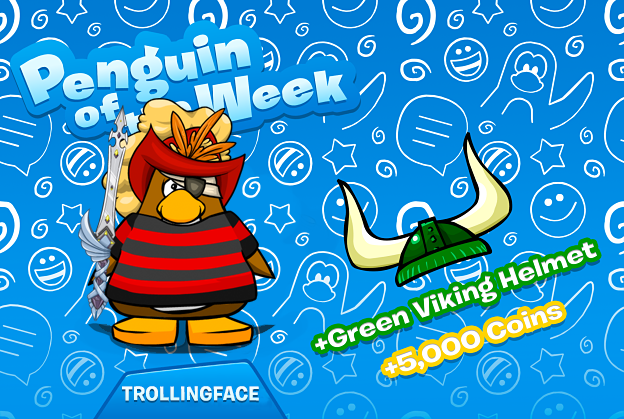 This week we are awarding the user TROLLINGFACE. TROLLINGFACE is an active member of the Spanish CPO community on Discord and in game. He always helps the new users and the moderators with the reports. He also participates in all the meetings, and recently opened a Youtube channel dedicated to CPO. Definitely he is the only Troll nice to meet. We had a fantastic #ModMeetup last week, and we hope to continue the momentum in tomorrow's event. We will be picking one or more trial moderators tomorrow, as we've announced two weeks prior that we're accepting new applicants for the moderator role. Do not be discouraged if you are not chosen tomorrow as we'll be picking trial moderators throughout the week. 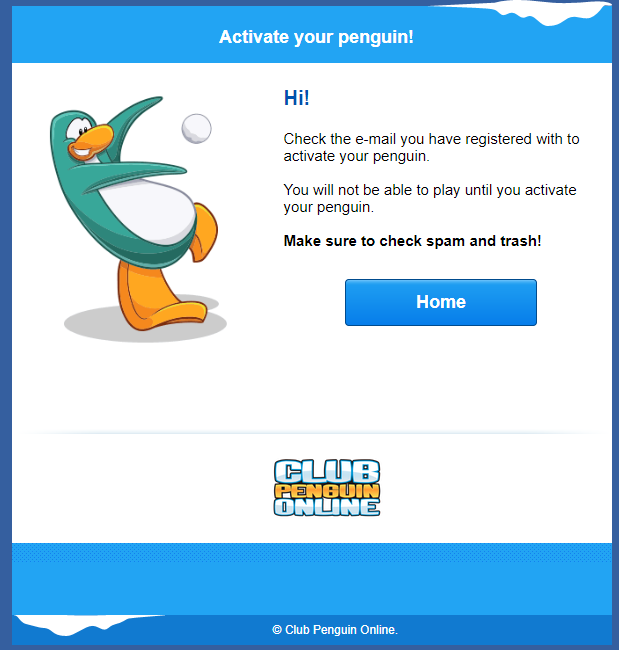 As most of you are aware, you're able to sign up to Club Penguin Online with a fake email. The reason behind this is because we do not need your email, the only time your email would be needed is if you wanted to reset the password to your account. However, we have noticed a lot of users tend to make a lot of alternative accounts to avoid getting banned, or just for trolling purposes. We have also recently noticed a lot of botting activities on our servers. So, in order to combat this we have officially added email activation to our register. What does this mean? It means you can register to Club Penguin Online normally, except this time you will need to enter a valid email address to receive the activation link. Please make sure to wait at least 5 minutes to receive the activation email and to check your spam and trash folder. If you experience any issues with the new register please contact an admin on our Discord server (link is provided on our website). Welcome to another edition of Penguin of The Week! 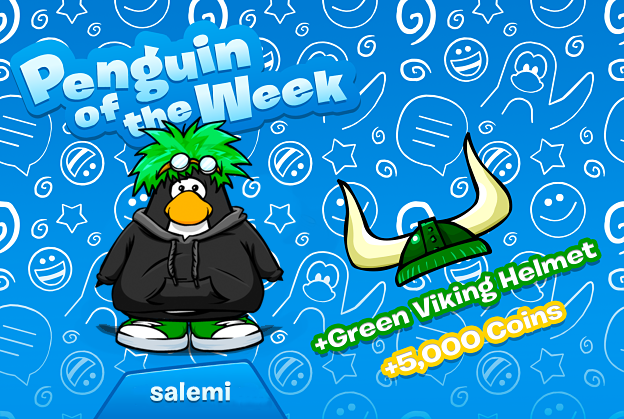 This week we are awarding the user Salemi, also known as 'Salem' on our Discord server, congratulations! Salem is a very active and respected member in our community. He helps our moderators by reporting misbehaving members and often helps community members with any problems they might face. He is also an active member in CPO's Ninjas army and helps out alot in planning events and moderating the server. In addition to that, Salem makes spectacular art such as penguins in human form.